Fruits and vegetables are ideal snacks for little ones. They’re packed with vitamins and antioxidants, and also contain useful amounts of minerals and trace elements. They also tend to be low in calories, protein and fat, which are all key components to support your toddler’s growth and development. Fruits and vegetables should feature at all meals and are a healthy addition at snack time, but by including them alongside other healthful foods for snacks, you boost the energy and nutrient density of your toddler’s diet. 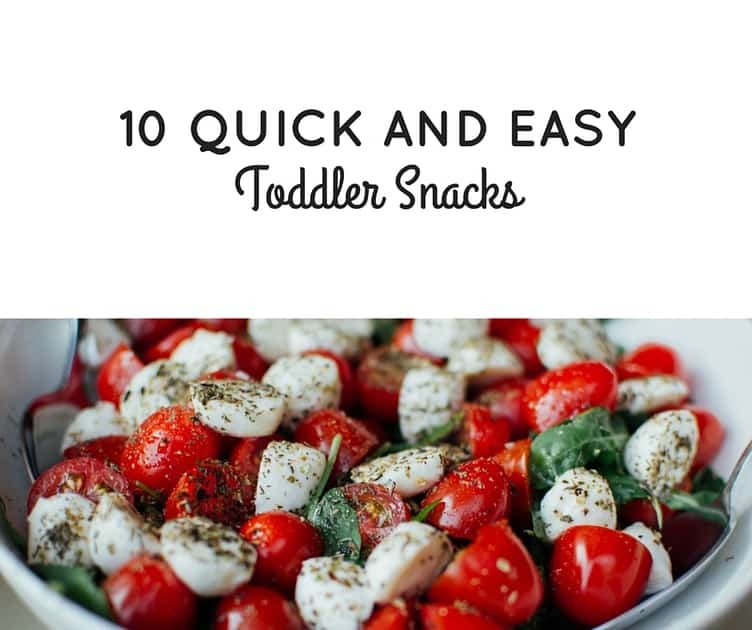 Here are ten quick and easy ideas for toddler snacks that incorporate fruits and vegetables. Like all dairy produce, fromage frais is a good source of protein for muscle and bone growth. Fromage frais is also packed with B vitamins, which are needed for energy release. Although the little pots of fruity fromage frais are often sugar-laden, serving slices of fruit alongside plain fromage frais is an excellent option for a nutritious snack. Strips of apple, pear, banana, mango and melon all work well for dipping. The thicker nature of fromage frais makes it a less messy dip than natural yogurt. Cheese is rich in calcium and phosphorus, both of which are essential for developing bones. Slices of apple, grape halves, raisins or even celery sticks all team up nicely with cheese for a snack. Cream cheese is lower in salt than hard cheeses, such as Cheddar, but still a good option for bone-building calcium. Top sliced mini bagels, crackers or toasted crumpets with soft cheese and slices of pineapple. Canned pineapple is a more convenient option than fresh pineapple, but just make sure you drain the rings or chunks well, as the juice can make the bread or crackers soggy. For a refreshing snack or dessert during warmer weather, lightly pulse frozen berries with a blender stick and stir through natural or Greek yogurt. The result is similar to ice cream, but without all the added sugar. Another healthy ice cream option is to freeze mashed banana; you can even put it in lolly molds. If you don’t have time to make your own hummus with canned chickpeas, tahini, garlic and lemon juice, store-bought hummus is still a nourishing option for your little one. If your tot follows a vegetarian or vegan diet, hummus adds extra protein, as well as calcium and iron. Sticks of pepper and carrot are naturally sweet, while cucumber and celery sticks are also popular when toddlers are teething. Although avocados are a fruit, they are rich in heart-healthy monounsaturated fats and vitamin E. As avocados are high in fat, they are high in calories, which makes avocado a good option if your toddler has a small appetite or struggles to gain enough weight. Buttered toast adds a further energy boost. Avocados have a bland taste, but you can enhance their appeal with a dash of lemon juice and some ground pepper. Tomato and mozzarella is the perfect combination, but you needn’t just limit this duo to pizzas. Halved cherry tomatoes and slices of mozzarella are ideal finger foods and the fat in the cheese helps your youngster to absorb the fat-soluble vitamins from the tomato more efficiently. Pita pockets make a welcome change from sandwiches and mini pitas are the perfect size for a snack. Your toddler gets a helping of carbohydrate, protein and fat from this snack, making it a well-rounded option. Vary the filling if pitas are a regular on the menu. Hummus or peanut butter are good alternatives to grated cheese, or change the filling completely to cooked meat or canned fish served with salad. Although flapjacks are usually loaded with sugar, you can make a lower sugar option by replacing the granulated sugar and syrup with fruit. Mashed bananas and a few tablespoons of orange juice make a good substitute. Meanwhile, the oats are slow release carbohydrates, so help your tot to keep up their energy levels till their next meal. Mash a ripe banana on toast and sprinkle with cinnamon. You might like to try this as an alternative breakfast option too. As you can see, there’s no need for toddler snacks to be boring. With a range of sweet and savory options to choose from, you can keep your little one’s diet varied and provide them with the nutrients they need for growth and development. Selecting Snacks for Toddlers (American Academy of Pediatrics) With all the energy your toddler uses, his stomach can’t hold enough to keep him from getting hungry between meals. Many children need a morning and afternoon snack, which should be timed so they won’t interfere with lunch or dinner. Snacks should include a satisfying balance of healthful foods. Healthy Eating for Kids: Teaching Your Child to Eat Healthy in a Fast Food World It is necessary for our children to maintain healthy eating habits. Early childhood obesity has become an epidemic, and obese children are now being diagnosed with serious adult diseases such as diabetes and heart disease. HEALTHY EATING FOR KIDS will give you ideas and information based on my experience and research about how to help children eat healthy in a busy fast food world. You will learn how I got started on this journey, foods and drinks that are harmful to the body, foods that support growth and longevity, ways to prepare meals along with recipes, ideas for the holidays, other health recommendations, and personal testimonies for overcoming obesity. After reading this book, you will definitely have more insight into how to ensure your children adopt and maintain a healthy lifestyle.